Timothy Piazza’s family. Image via the AP. 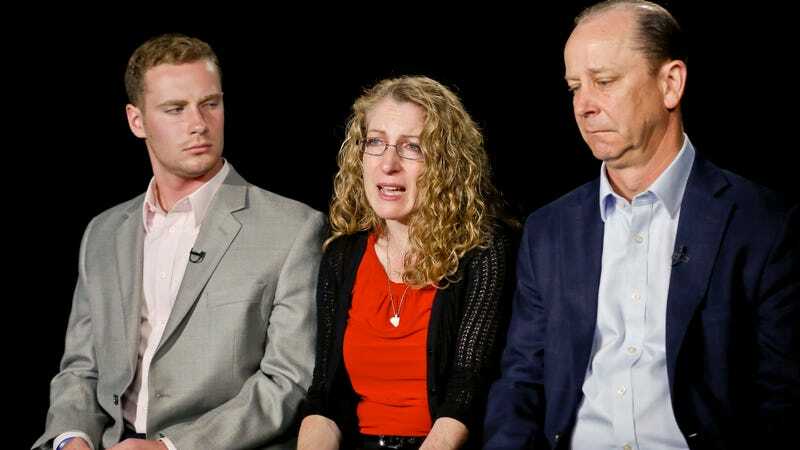 A judge has thrown out involuntary manslaughter charges against eight Beta Theta Pi brothers at Penn State who, in February, waited 40 minutes to call 911 in order to help a brother who laid unconscious in a rigor mortis-like state. District Attorney Stacy Parks Miller had argued that they had rushed 19-year-old sophomore Timothy Piazza and other pledges “through a speed-drinking ‘gauntlet,’” instructing them to finish a large bottle of vodka, the Chicago Tribune reports. Surveillance footage shows Piazza, a hazing victim, falling down, puking, and writhing throughout the night while brothers stepped over his half-conscious body. A grand jury investigation detailed by ABC News found that after falling headfirst down the basement stairs at around 11 PM, they carried his body to a couch. A new member saw Piazza writhing in agony and screamed for help; a senior initiate shoved him against the wall and told him they “had it under control,” which more or less meant splashing water on his face. This went on til around 10 AM, when frat members once again found Piazza lying in the basement. They carried him back to the couch where he laid in what State College Police Detective Dave Scicchitano described as a “corpse-like” state, and scrolled through their phones, CNN reports, til finally calling 911 at 10:48 AM. Piazza was pronounced dead of a traumatic brain injury a few hours after arriving at the hospital. District Attorney Stacy Parks Miller plans to refile the charges. The eight Beta Theta Pi brothers and six other members will still stand trial for lesser counts including reckless endangerment, furnishing alcohol to minors and hazing. Beta Theta Pi had already been banned from serving alcohol, but a house advisor reported that it had been granted a special permit for this particular “party.” The frat is now banned from campus. But unlike Harvard and other universities which would like to flush Greek life altogether, Penn State president Eric Barron has chosen instead to “assume control and responsibility from the Greek-letter organizations for monitoring and adjudication of their chapter misconduct.” This includes “unannounced drop-ins,” barring first-semester freshmen, and a no-tolerance hazing policy.